The main objective of my role as Digital Fellow at Royal Pavilion & Museums, Brighton & Hove (RPM) is to consider how we might develop the digital confidence of the workforce and empower greater personal storytelling using technology around the museum’s collection. I have been undertaking initial scoping work across RPM’s five sites which includes informal conversations with key staff members, gathering different perspectives on the role of digital in the organisation as well as undertaking ethnographic-style observations. RPM is currently working towards becoming an independent trust, separating from the local authority. Once this happens, the institution should have more freedom over how it manages its online presence, especially with the use of social media. Before any kind of personal storytelling interventions can take place – in the form of creating a series of staff-led podcasts and/or a re-energised staff blog – I have identified a need to develop a coherent approach to social media that represents the organisation’s mission, vision and civic role in Brighton and Hove. Together with RPM, I have invited all staff members – regardless of skill or interest in social media – to attend one of three 90-minute Social Media Workshops so that they can have their say in building a social media blueprint for RPM. Based on these sessions, I will construct a blueprint for the organisation, intended to inform its social media strategy following transition to independent trust. We will test this blueprint through the curation of a series of staff-led storytelling projects, that will make use of technology to engage diverse audiences. Why have you chosen this photo to illustrate your project so far? This is a picture of a floppy desk with the question ‘why digital strategy?’ vaguely written on it. 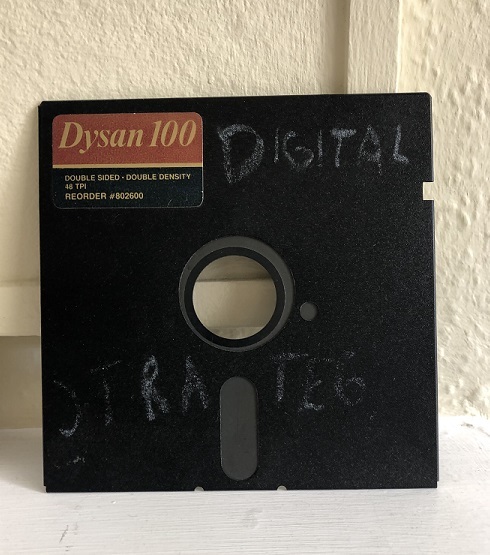 It leans on a shelf in Kevin Bacon’s office – Kevin is the Digital Manager at RPM – and I thought it sums up well the unsettling combination of hilarity, irony and optimism that frequently applies when researching digital transformation in the cultural sector.